Solar power was the fastest growing source of electricity for US utilities in 2011 as power providers interconnected more than 62,500 solar photovoltaic (PV) systems last year, setting a record high for the fourth consecutive year. 2011′s results show a 38% increase in the number of solar PV installations utilities participated in and a 120% increase in the total megawatts installed, according to the Solar Electric Power Association’s “2011 SEPA Top 10 Utility Solar Rankings” report. Thirteen electric utilities interconnected more than 1,000 solar PV systems and 22 interconnected more than 500. Unsurprisingly, California utilities were well represented in SEPA’s 2011 Top 10: PG&E topped SEPA’s rankings in terms of annual solar megawatts installed (MW-ac) with 287.7, SCE ranked fourth at 138.5 MW-ac and Sacramento Municipal Utility District ranked seventh, having installed 52.8 MW of solar PV. Perhaps more surprisingly, New Jersey utilities were very well represented: PSE&G (#2, 181.3 MW-ac), Atlantic City Electric (#5, 61.2 MW-ac) and JCP&L (#6, 53 MW-ac) made SEPA’s 2011 Top 10. SEPA’s US map of Top 10 Utilities installing grid-connected solar PV systems in 2011 also clearly shows how much more potential there is for solar energy adoption across the US. 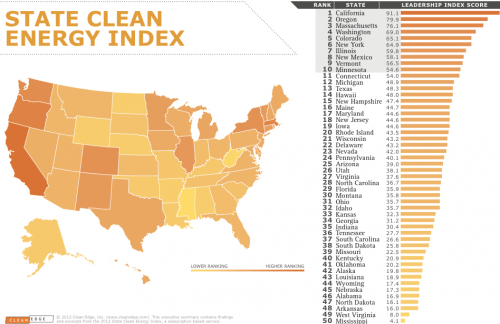 Utilities in just eight states cracked SEPA’s 2011 Top 10 either in terms of total capacity or Watts/customer: Arizona, California, Colorado, Georgia, New Jersey, New Mexico, New York and Tennessee. California and New Jersey utilities’ progress and success in installing solar PV systems offers somewhat contrasting perspectives as to how government policies can spur solar PV growth and adoption, particularly in terms of centralized vs. distributed solar PV systems installations. Moreover, SEPA’s 2011 Top 10 looks very different from the perspective of “Annual Solar Watts per Customer” (Watts-ac). New Jersey’s Vineland Municipal Electric Utility topped the rankings, having installed an average 768.5 Watts-ac per customer, more than triple the amount of #2-ranked Blue Ridge Mt Electric Membership Corp of Georgia, with an average of 192.4 Watts-ac. Tennessee’s Fayetville Public Utilities ranked third with an average 147.6 Watts-ac. The US solar PV base continues to grow despite financial and economic headwinds and the expiry of the Treasury 1603 grant program. 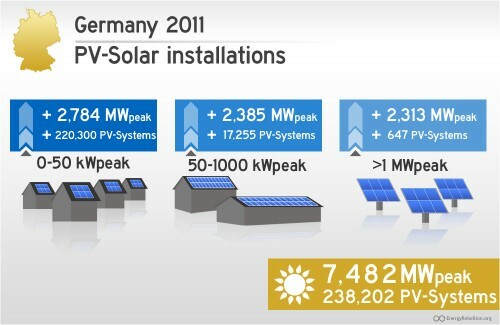 It took a minimum 45 MW of solar PV installations to crack SEPA’s 2011 Top 10 as compared to 2010′s 20 MW. This was also reflected in terms of installed solar capacity per customer. It took 83 W/c to make SEPA’s Top 10 in 2011 as compared to 28 W/c in 2010. Five utilities made SEPA’s 2011 Top 10 in terms of both total solar PV capacity installed and average Watts installed per customer: Arizona Public Services (144.4 MW-ac; 128.7 W/c); Xcel Energy NM (45.6 MW-ac; 115.5 W/c); Atlantic City Electric Co (NJ) (61.2 MW-ac; 114.5 W/c); Sacramento Municipal Utility District (52.8 MW-ac; 88.5 W/c); and Public Service Electric & Gas Co. (NJ) (181.3 MW-ac; 85.7 W/c). Taking a look at centralized vs. distributed solar PV installations, a tend toward utility-led solar PV initiatives was in evidence in 2011, SEPA noted. Customer-owned, net-metered systems dominated grid-integrated solar PV installations a few years ago. In 2011, there was “a marked shift toward the utility-side of the meter as utilities influence solar markets in new ways,” according to SEPA. That’s not to say that residential solar PV installations don’t continue to grow. By number, residential solar PV installations accounted for more than 89% of 2011′s total. Commercial rooftop installations made up more than 53% of total solar PV capacity installed. Utilities procured 39% of new solar PV capacity in 2011 as compared to just 9% in 2008, SEPA pointed out. SEPA defines this sector as made up of direct wholesale purchases and utility-owned projects, which last year made up 26% and 13% of the US solar PV market, respectively. Large-scale utility projects accounted for most of 2011′s added capacity, with an estimated 18 projects totaling 332 MW, up from 226 MW in 2010. SEPA estimates that the utility solar PV market segment could grow to 1500 MW in 2012, adding the equivalent of the entire market as of year-end 2011. Need Solar at your home or building?